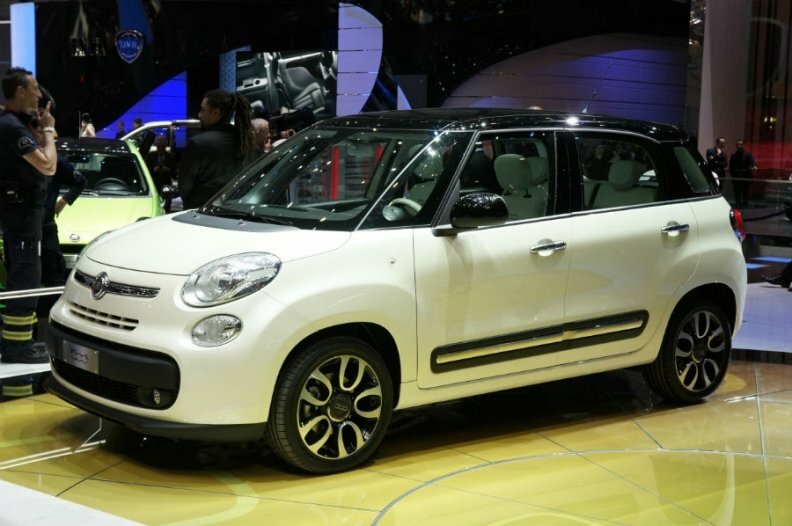 The Fiat 500X small crossover will share its underpinnings with the 500L, shown here at the Geneva auto show. TURIN – Fiat plans to start production of a crossover variant of its 500 minicar next year. The new model will be called the 500X, with the letter X standing for cross, company sources told Automotive News Europe. The car will replace the Sedici in Fiat's lineup. Like the Sedici, it will have SUV and hatchback styling. The 500X will be the fifth variant in the 500 range, joining the 500 three-door hatchback, Abarth performance version, 500C convertible and the 500L four-door, high-roof hatchback. At about 4200mm long, the 500X will be the longest model in the 500 family. Like the 500L, it will use a widened version of Fiat's small vehicle architecture that underpins the Punto subcompact. The 500X will be built at Fiat's Mirafiori plant in Turin and will be the first variant of the current 500 range made in Italy. The Sedici is built alongside its sister model, the Suzuki SX4, at the Japanese automaker's factory in Hungary. The 500 three-door variant is built in Poland for European markets and by Chrysler in Mexico for North America and China. Fiat plans to begin production of the 500X in December 2013, part of a 1 billion-euro expansion of the Mirafiori plant's capacity to build 280,000 small crossovers a year. The 500X will be built alongside a new Jeep small SUV, code-named B-SUV, which will go into production in the second quarter of 2014. The B-SUV will be smaller than the Jeep Compass and Patriot and will be sold in the United States, Europe and other markets. The 500X will be offered with front-wheel- and all-wheel-drive variants. The Jeep sister model will also come with a trail-rated version, crucial for the U.S. market. For Europe, the Fiat 500X and the Jeep B-SUV will be offered with Fiat's 900cc, two-cylinder and 1.4-liter, four-cylinder gasoline engines, as well as with the latest evolution of the company's 1.3-liter diesel, called MultiJet II. Fiat needs a replacement for the aging Sedici, whose sales in Europe fell 10 percent to 14,761, according to market researchers JATO Dynamics.